Influence Consulting gets the news out about your good work and services to the media and key stakeholders. We create communication strategies that move policy issues forward, enhance reputations, and raise donations. Influence Consulting has deep experience working with mission-driven organizations to expand communications capacity. The principal of Influence Consulting is Susan Ryan-Vollmar. She is a communications professional with more than 20 years of experience, 15 of them as a journalist. Working closely with clients, Susan develops strategic messages and utilizes print and broadcast media, niche publications, and social media to get those messages out. She can help plan and, if necessary, run short- and long-term communications campaigns. Such campaigns include advocacy supporting passage of legislation; event publicity; or the release of a study, report, or other policy work. She is skilled in public relations, message development, media training, content creation, and crisis communications. She will work closely with your team and, if necessary, bring in other professionals with expertise in video, design, website construction and maintenance, and paid and earned SEO to support your campaign. We create messages that resonate with policymakers, elected officials, the media, clients, and customers. We create campaigns to get your messages out, and we work closely with you to run those campaigns. Influence Consulting specializes in working with mission-driven organizations. We develop close, collaborative working relationships that get great results. Together, we move policy issues forward, enhance organizational and individual reputations, and raise donations. "MPHA has significantly strengthened our communications impact by working with Susan. She is a collaborative thinker and good sounding board on strategic issues dealing with communications and politics. I can rely on her to be clear and direct, honest and encouraging all at the same time. She is helping us—a small organization—build our communications savvy and capacity through direct work, as well as joint planning and guidance. She’s raised the bar for our organizational communications." 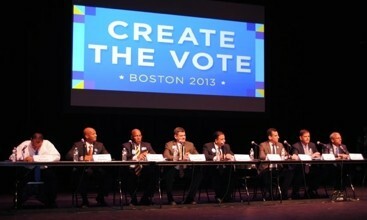 During the 2013 Boston mayoral election, MASSCreative sought to raise the profile of arts and cultural issues among candidates with the Create the Vote campaign. The ultimate goal was to ensure that the next mayor would support the arts sector, and to also educate and engage voters about the candidates’ platforms on the arts. Influence Consulting helped generate more than 40 news articles and spur active conversation about the Create the Vote campaign on social media. 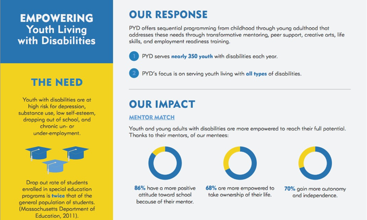 Over its 30-year history, Partners for Youth with Disabilities has grown from a mentoring organization to one that engages in organizational training, life skills development, and career readiness programs. Its organizational messaging and marketing materials failed to keep pace with its expanded mission. During a six-month engagement, Influence Consulting assisted with refreshing PYD’s messaging, programmatic brochures, infographics, and social media accounts. Over a one-year period, Influence Consulting helped generate sympathetic media coverage of transgender people and the challenges they face living in a state without civil rights protections. The campaign was launched to support passage of the Transgender Equal Rights Bill and focused on influencing legislators. We helped place more than 100 news pieces and 25 favorable opinion pieces. The bill was passed by the state legislature in November 2011 and signed into law by Gov. 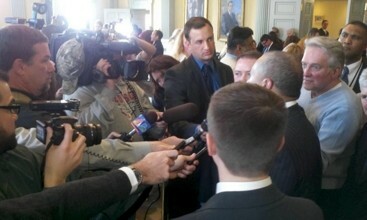 Deval Patrick on November 23, 2011.